June 24, 2018, Blog by Meghan Gill, Community Psychology, Psychology Chile: A Changing Public & Mental Health Care System. I’m pretty sure the travel bug is genetically heritable. My grandparents were fortunate enough to be able to travel extensively, especially after my grandfather’s retirement. As a result, I grew up hearing stories of their travels and gazing in awe at the photographs and souvenirs they would return home with. My parents both traveled some in their 20s, but once they started having kids apparently traveling became more difficult. Go figure. While my family took my sisters and I on multiple vacations around the United States, we never had the opportunity to go abroad. However, I knew I was (somehow) going to globe-trot at some point. As a transfer student from Cascadia College, the options and financing for their study abroad partnerships were limited. While I can confidently say that I didn’t choose to attend UW because of the excellent study abroad programs they offer, I’d be lying if I said I didn’t immediately start browsing the program search page as soon as my acceptance letter from UW Bothell came in the mail. I didn’t really know what I was looking for, but I knew my available elective credits would be significantly limited because of my major and minor requirements. These restrictions narrowed my options pretty quickly to an early fall exploration seminar, which falls conveniently between summer quarter and fall quarter and uses only 5 of my limited elective credits. The options for early fall exploration seminars are impressively diverse, and I struggled to narrow down to only three programs I was interested in applying to. After finally narrowing my options, I began gathering letters of recommendation, writing my application essays, and attending information and interview sessions conducted by the program professors. My interest in the Chile program was three-fold. Firstly, the topic aligned with my community psychology major perfectly, which made this program my first choice. Secondly, I’ve wanted for a long time to travel to South America for multiple reasons–mostly because the landscape and culture seems so stunningly beautiful and vibrant, and I also speak a bit of Spanish so I felt more prepared for being immersed in another language for a month. Thirdly, Lonely Planet named Chile the country to travel to in 2018, and seeing their overview of the country made up my mind as this being a place I needed to visit. I may or may not have cried once I got the email that I was accepted to the program. Once I knew where I was going, both excitement and anxiety ensued. So much planning to do—flights to purchase, supplies to gather, and decisions to be made about traveling independently after the program. 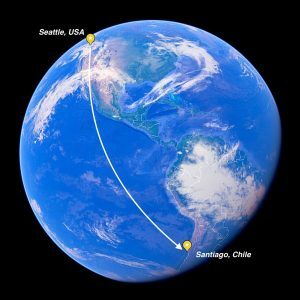 The study abroad will take us to three cities: Santiago, Iquique, and Arica. Iquique and Arica are both located in Northern Chile, and Santiago is roughly in the center of the long, narrow country. While we will cover a lot of ground, I was disappointed that I would be in Chile and miss a major bucket-list item for me—Patagonia. Located in the southernmost tip of Chile and stretching into Argentina, Patagonia is a nature-lover’s paradise. So, after some brief research on the realistic cost of this venture, I reached out to my fellow program members and recruited one of them as my travel buddy. Now in addition to planning for the study abroad, we both are planning and organizing our post-program trip to Torres Del Paine Parque Nacional (Towers of Blue National Park—“Paine” means blue in the language of the indigenous people group, the Tehuelche). There are so many facets to this study abroad experience, and so many things I want to get out of it. Academically as an aspiring psychologist, I hope to better understand how culture influences perception and treatment of mental health, as well as help me understand diversity better. I could list a multitude of psychological studies that have shown how global travel helps dispel stereotypes, broaden perspectives, and help with understanding and empathy—all things a good psychologist should be strong in—but you as the reader are probably relieved I’m not writing a research paper on here, so I’ll keep the technicalities of the studies to a minimum. Personally, I yearn for adventure, I love experiences that challenge my thinking and push me to get out of my comfort zone. I think this trip will accomplish these goals on multiple levels, since I’ll be adjusting to and interacting with a new culture, immersed in a language I’m definitely not fluent in, interacting with a group of other students I’ve only met a few times, and experiencing new places and challenges I can’t even anticipate yet. I fully expect to return home a changed person, and from what I’ve heard from previous travelers, it’s pretty unanimous that it’s a change for the better. While abroad, I hope to hone my interpersonal skills; improve my Spanish; really get to know the Chileans I have the opportunity to interact with; learn more about this amazing country’s culture, history, and landscape; be able compare and analyze the health care system of the United States and Chile; and come back with a billion things to write about and some incredible memories and life lessons. ¡Hasta la próxima vez (until next time)!